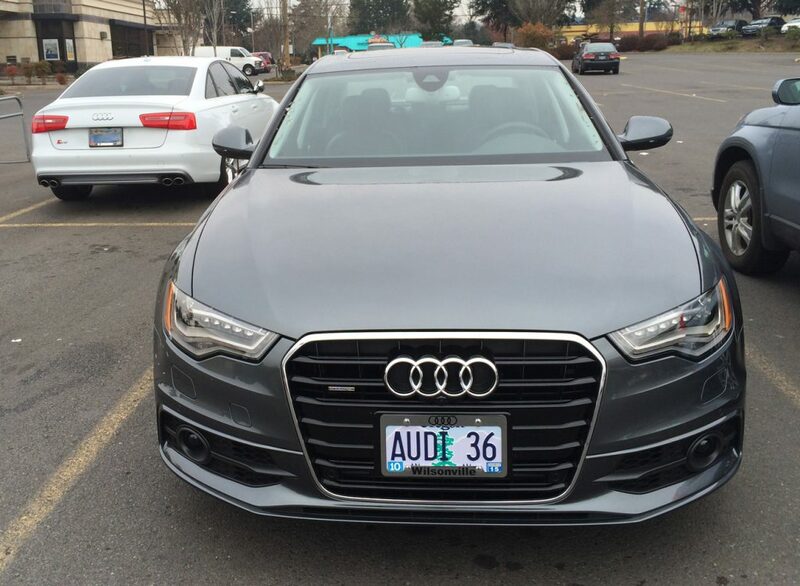 On Monday, I brought my #LoveMyS5 down to Audi Wilsonville for its 3 year/35,000 mile scheduled maintenance that would normally take a couple of hours to complete and I would be on my way. So, I brought my laptop and camera with me to take some photos. About an hour or so, the service technicians noticed a bit of a leak from the rear differential. So, parts had to be ordered and I had the option of leaving the car there and get a loaner, or bring it back. 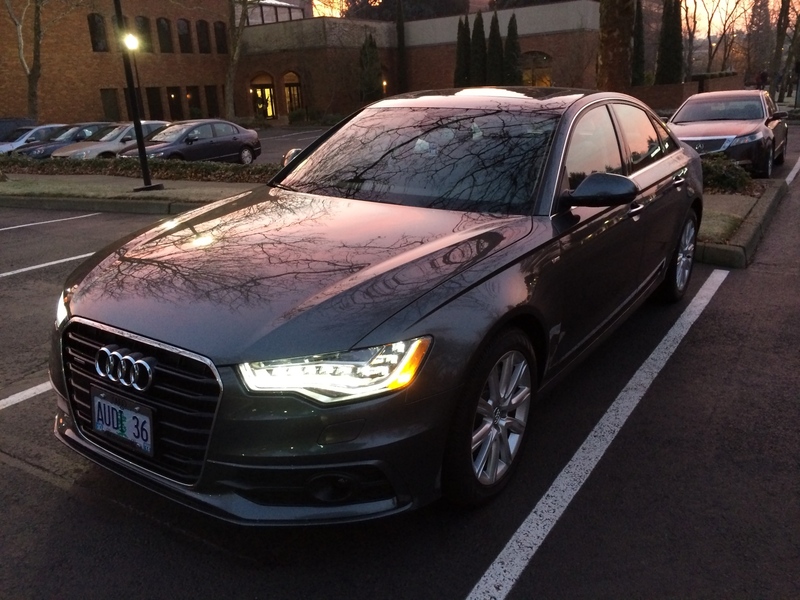 I opted for the former and that gave me a chance to get a 2014 Audi A6 3.0 TDI as a loaner vehicle (how could I pass that up?). Good gravy, does the 3.0 TDI have a lot of oomph off. Off the line acceleration is slightly dampened with a bit of throttle and turbo lag when in D and less so in S; but, after that wee bit of lag, the car just plain launches when the pedal is to the metal. Absolutely love it! The A6 TDI is equipped with the super-snazzy Bang & Olufsen sound system with the iconic pop-up tweeters. One of the first songs that I had to listen to was Prodigy’s “Diesel Power”. It may not be the best song to do the system justice, but I think it was quite apropos. Compared to the base Bose system that I’ve experienced in an A7 and A8, the B&O system does provide a bit more of a rich, fuller sound and emphasis on mid-tones. It wouldn’t be a must-have on my build list if I were to order an A6, A7 or A8. With the relatively cold snap here in Oregon, the heated steering wheel included in the Cold Weather Package has been shamelessly used almost the entire time that I’ve had the car. The auto start/stop system is more noticeable in the 3.0 TDI than with the 3.0 TFSI, only because the 3.0 TDI’s extra torque-y start up can be felt more. Granted, the cold weather and copious use of the heater, seat warmer and steering wheel warmer has meant that the system hasn’t really kicked in too often. The A6 TDI’s fuel economy is rated at 24 city, 38 highway and 29 combined and many people have exceeded those numbers by a long ways; but, combining jack rabbit starts, liberal use the gearbox’s “S” mode and keeping the interior cozy has kept average fuel usage to around 18-20 MPG. I haven’t had a chance to use the adaptive cruise control with stop and go as most of my commute has been pretty much devoid of highway or freeway stints. With a number of not-so-smart drivers on the frosty roads has lead to a couple of instances of Audi pre sense plus throwing warnings about the distance between the car in front of me and the A6. Thankfully, I was able to brake in time. I did not make use of the active lane assist or the blind spot monitoring system, as I know how the side mirrors should be set to avoid blind spots. It is so nice to not have a power opening/closing trunk/boot or hatch. No having to wait 5-10 seconds for it to open or close after pressing a button. Of the A6, A7 and A8 trio of larger sedans, I love the LED headlights and DRL on the A6 line the most. There’s something about the way the DRLs are shaped and then enhanced by the LED headlight elements themselves. If I were in the market for an A6, I would easily choose the 3.0 TDI over the 3.0 TFSI for two reasons: the torque-tastic diesel engine and the combination of great fuel economy and driving range on a single tank. Yes, there is a $2,400 price premium for choosing the 3.0 TDI over the 3.0 TFSI and the TDI won’t be as nimble or fast as the 3.0 TFSI. The latter isn’t really a problem, since I would rather save up a bit more and go with the S6 if I wanted a sports sedan with some creature comforts. Instead, the A6 3.0 TDI would be a perfect daily driver, weekend cruiser and road trip car. Now… if only the United States weren’t so wagon-averse and we could get the A6 Avant 3.0 TDI over here.